In 2015 I stayed in hotels way more than I ever would have imagined. Starwood hotels alone accounted for 107 nights. I do have a home of my own in Charlotte. Hilton, Hyatt and assorted other hotels accounted for a handful of additional stays. I hit a couple of milestones with SPG in 2015. First, I reached Lifetime Platinum status. Reaching Platinum Lifetime status required staying 500 nights at SPG properties since 1999 and 10 years of annual Platinum status. Lifetime Platinum status means I need not stay 50 nights or accumulate 25 stays at SPG hotels to have SPG Platinum status in any year going forward. To prevent my status from lapsing, the only requirement is to have some activity of any type in my account. Using one of my SPG Amex credit cards suffices. Lifetime Platinum entitles me to the basic Platinum benefits such as an upgrade to the best available room at check in, including standard suites, an additional starpoint for each dollar spent on hotel rates and certain other hotel charges, lounge access, premium wifi and full breakfast at some SPG properties. The second milestone was achieving Ambassador status. I assume there will be some welcome information other than an email, but I have not received it yet since I just qualified in early December. Ambassador status is an annual benefit and requires 100 nights in one yearr in SPG hotels. Any night counts regardless of if it is a paid stay, points, or a points-and-cash stay. The additional benefit that Ambassador status bestows is the assignment of an SPG Ambassador representative who serves as a personal concierge to assist with hotel reservations and any other travel needs such as dinning reservations, sightseeing, any special needs or arrangements, etc. After making Ambassador status, I only had one SPG stay in 2015 to judge how this would affect my Starwood stays. Over the Christmas holidays I stayed at the Westin hotel in Cincinnati. 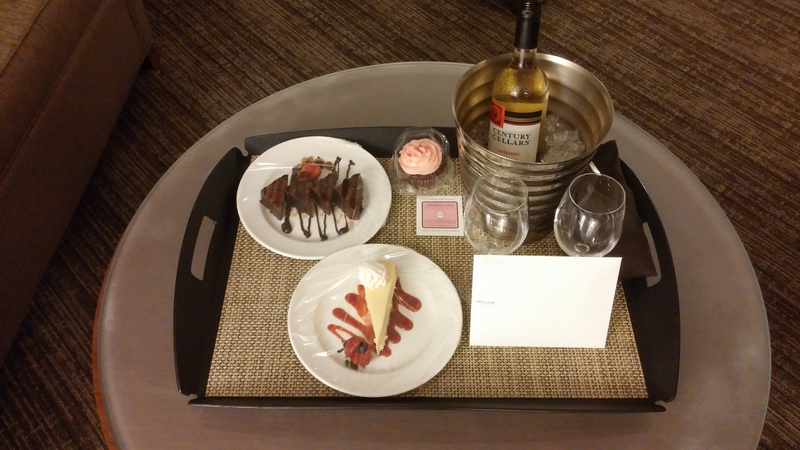 Although I had a little trouble with my request for a Your24 check in at 1:00 a.m. on December 24, it was ultimately confirmed after appealing to my Ambassador, and I received an above-and-beyond welcome gift of sweet treats and a chilled bottle of wine that was waiting for me in the room when I arrived. The hotel even brought some giant Christmas cookies the next day in case I was running low on sugar :). 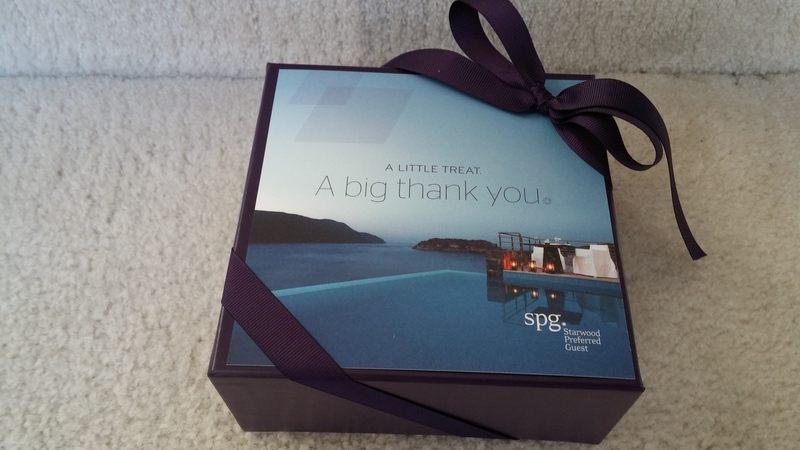 Starwood also sent a nice gift of assorted chocolates to my home for Christmas. I had some great stays at Starwood properties in 2015. Making Lifetime platinum and Ambassador status is terrific. Unfortunately, late in 2015 Starwood announced that it was being acquired by Marriott. The future of all SPG benefits is up in the air right now. That presents a quandary for 2016. Do I continue to stay primarily at SPG hotels or do I stay at Hyatt or Hilton to ensure elite status in one of those chains for 2017 if Marriott ruins the SPG program? Thanks to Lifetime Platinum status, I can more evenly spread my hotel stays among several chains this year without risking making SPG Platinum for 2017. Late last year Hyatt made a smart marketing move. It offered to match the status of elites in other hotel programs. The target, I believe, was primarily SPG elites who were nervous about the Marriott merger. I only had to send a picture of my Starwood Platinum membership card and presto Hyatt matched me at Diamond, the highest level in the Hyatt Gold Passport program. Hyatt Diamond status offers benefits similar to SPG Platinum. The most signifigant differnece, IMO, is the upgrqde policy. Starwood permits Platinums to upgrade to the best available room at check in, including standard suites. Hyatt Diamonds are only able to upgrade at check in to non suites. Starwood offers Platinums who stay 50 nights in a year the ability to choose 10 Suite Night Awards (SNA) that can be used to request an upgrade when you make a reservation. The request can be confirmed by the hotel between five and two days prior to check in if a suite is available. You need one SNA for each night of a stay. So a maximum of 10 nights per uyear. Hyatt allows each Diamond to upgrade to a suite four times per year at the time of reservation if a suite is available at that time. The beauty of these upgrades is they are confirmed when the reservation is made, as opposed to a few days before check in, and one request applies to the entire stay up to a maximum of seven days. So Hyatt confirmed upgrades could apply to as many as 28 nights per year. Further by upgrading when the reservation is made rather than shortly before check in, there is a greater likelihood of suites being available and the request being approved. If Marriott was smart it would let SPG elites know as soon as possible how the SPG program will fare in the merger otherwise we will be tempted to move to other programs where there is more certainty about the benefits we will be earning. I had one Hyatt stay in 2015. It was at the Hyatt Regency in Cincinnati over Christmas. I used one of my four suite upgrades to get a suite for two nights. The suite was huge. It had a dinning table for six, a wet bar with a full-size refrigerator, and a large sitting area big enough for a Superbowl party. I will have three remaining Hyatt suite upgrades that I can use at anytime in 2016 (as long as they are booked by March 1, 2016) plus I will get an additional four when the new membership year stats on March 1, 2016. I only had a couple of stays with Hilton in 2015. The most memorable was for one night at the Hilton in Nairobi, Kenya. It was the worst hotel room I’ve had in ages considering the price I paid. I did not even bother to take pictures. In spite of that stay, I got a status match to Hilton Diamond status for 2016 when Hilton was giving those out to anyone who asked at the end of 2015. I do not anticipate a lot of Hilton stays in 2016, but for the few I will have, Diamond status should help me score a complementary suite upgrade or two. Since I won’t requalify for Diamond in 2017, this year I plan to get the Hilton credit card that guarantees Gold status and free breakfast at Hilton properties. Although I like to concentrate my hotel stays at chains where I can accumulate points in and take advantage of elite benefits, some of my nicest and most interesting stays in 2015 were in hotels other than those operated by the big US chain hotels. I have seen Peninsula Hotels in many Asian cities. They always look luxurious. In November 2015, I finally got to experience staying at a Peninsula Hotel in Manila. Normally I would not shell out the dough to stay at the Peninsula. Thanks to Agoda points, however, I could take $100 off and that made it palatably outrageous for me for one night. Plus I stayed there right after all the APEC delegates left, so prices were a little depressed to begin with. One of the most picturesque stays in 2015 was in Boracay, Phillipines. I was attending the Manila-Boracay Salsa Festival. I found a great place right on the beach. The most remote stay was during a safari in the Maasai Mara Game reserve in Kenya. I won’t say it was exactly roughing it though. The camp came with insect-proof tents with soft beds and indoor plumbing. Our ancestors in the Great Rift Valley of eastern Africa never had it so good. 2015 was a pretty good year. What will 2016 bring?